GROHE will implement the design relaunch of the Atrio faucet series in April of 2018. The portfolio comprises more than 35 products and is available in two SPA colours and in Chrome. 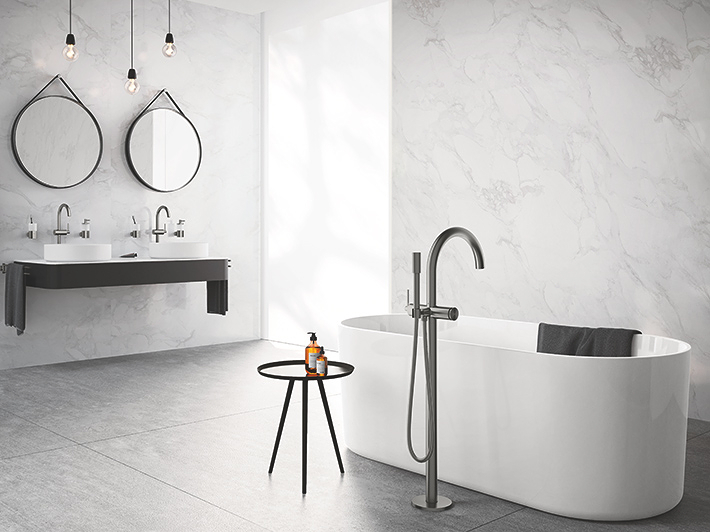 Atrio features a minimalist look and blends harmoniously into a wide variety of bathroom styles. With Atrio, GROHE relaunches the icon of elegance and precision and establishes a "piece of art" in the bathroom. The faucet’s slim body has been reduced to its essentials, with the characteristic cross handles giving it an extravagant look. Hence, the timeless design of the new Atrio collection blends harmoniously into any individual bathroom style – whether it’s contemporary with conventional aesthetics, classic in nostalgic decadence or minimalistic with the geometry of a cosmopolitan style. The timeless design offers architects, interior designers and creative premium bathroom planners as well as sophisticated consumers the opportunity to combine individual design options with international architectural trends and thus to stand out from the crowd. Adapted to the highest design requirements, Atrio’s coordinated design features a minimalist look, balanced proportions and pure cylindrical shapes, creating an arc of elegance and precision: the circle. 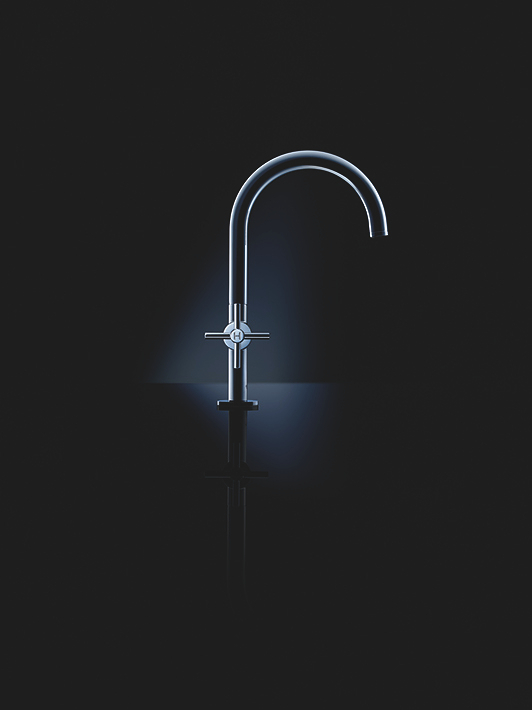 The elegant faucet’s body measures the same diameter from spout to bottom – a one-of-a-kind base in the industry. In total, the new Atrio series includes more than 35 products in a unified design, available in the two GROHE SPA colours SuperSteel and Brushed Hard Graphite as well as in Chrome . The faucet has ergonomic handles for manually mixing cold and hot water with each other: the signature cross handle and an elegant lever. The handles with C and H markings regulate the water’s volume and temperature. For absolute comfort, the handles can be rotated very easily and smoothly. The revised design of the Atrio collection features not only elegant aesthetics, but also precise technology in highest engineering with quality “Made in Germany”. 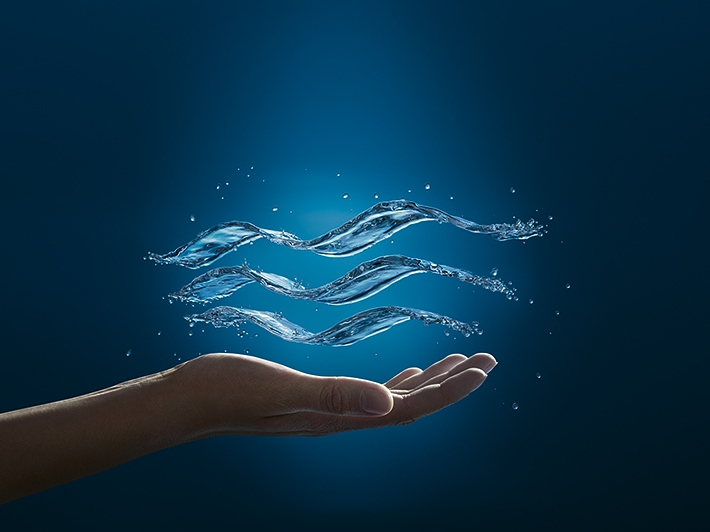 All faucets use state-of-the-art GROHE cartridge technology. The integrated jet regulator ensures a constant and flat flow of water, which pleasantly encloses the hands during washing. The washbasin faucets are available as single-lever basin mixer, one-hole basin mixer with two handles and 3-hole basin mixer. The latter can be mounted on the washbasin’s deck or on the wall. GROHE's new range of Atrio faucets has been presented for the first time at the Kitchen & Bath Industry Show (KBIS) in Orlando from January 9th to 11th of 2018 and will be available starting in April of 2018.